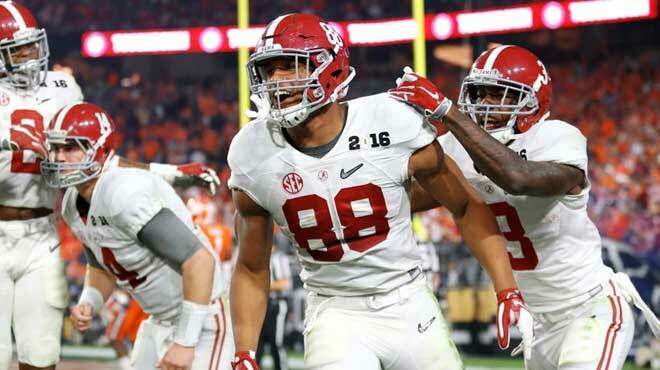 Top U.S. sportsbooks favor the Alabama Roll Tide to win the 2017-2018 NCAA football national championship over the 2017 College Football Playoff National Champions Clemson Tigers. Other favorites at best sportsbooks like MyBookie include Ohio State, Florida State, USC and Oklahoma – which on closer inspection all have better odds than Clemson. That’s odd. Alabama entered the 2016 season ranked No. 1 in the AP and Coaches polls and remained so 1 for the entirety of the betting season before losing the national championship against Clemson. The Tide finished the regular season with a 13-0 record (8-0 in SEC play). Alabama won the Southeastern Conference’s Western Division and met the Florida Gators in the 2016 SEC Championship Game in a rematch from the previous season’s SEC Championship. Bama beat the Gators 54-16 for the school’s 26th conference title. As the top seed in the third season of the CFP, UA was selected to play in the 2016 Peach Bowl against No. 4 Washington Huskies Alabama won the semifinal 24-7 to advance to the 2017 CFP National Championship Game versus No. 2 Clemson in yet another rematch from the previous year. The Tide lost to the Tigers 35-31. The Roll Tide finished the 2016 season 14–1. The Tide will have lost 23 senior football players to graduation and/or the NFL draft by the time the 2017 regular season officially starts. On the other hand eight starters will return on offense, as well as another eight on defense. One of those returning starters is 2016 SEC Offensive Player of the Year and SEC Freshman of the Year QB Jalen Hurts, which might account in no small part for Alabama’s status as odds-on favorite on most betting websites. Hurts finished 2016 2nd in the SEC in pass completions (240); 3rd in pass attempts (382), passing yards per attempt (7.3), passing TDs (23), rushing TDs, (13), total TDs (36), and total yards (3734); 4th in passing yards (2780), and pass completion percentage (62.8); and 6th in passing rating (139.1), among other achievements. The 2017 betting season will be Alabama’s 11th with head coach Nick Saban. During the 2016 season Saban had his 10th straight win over Arkansas; his 200th win as a college head coach; his ninth consecutive season winning 10 or more games; 7th SEC West Division Championship and 5th SEC title with Alabama; and third 12-0 regular season. On the other hand, Saban had his first loss in a championship game. All things considered, coach Saban is another reason that the Tide is a heavy favorite at top sportsbooks online. While Saban will have his longtime associate HC Burton Burns by his side, Bama’s coaching staff has gone through a bit of a renovation; Brian Daboll (Offensive Coordinator and Quarterbacks coach), Joe Pannunzio (Tight End coach and Special teams coordinator) will start their first years in their current positions, while Tosh Lupoi and Mike Locksley have been promoted to Co-Defensive Coordinator and Co-Offensive coordinator respectively. Additionally, Derrick Ansley, Karl Dunbar, Brent Key, and Jeremy Pruitt are all second-year coaching staff members.